I heard a flock of robins this morning, murmuring softly to each other in the silver maples and hackberries. A male cardinal, tucked into our arbor vitae, whistled his “what cheer” melody. They sang memories of my dear friend Cathy Borden, who died one year ago today. Cathy loved birds and, as I held her hand in the silence of a January evening, a flock of robins filled the trees outside her window at Our Lady of Peace hospice. She would have loved seeing the robins. Though she wasn’t conscious, she stirred when I described their rusty breasts, black heads and charcoal backs, and how they picked berries in the twilight. I spun tales of steamy summer afternoons when we hiked the woods and fields of Eagan, just a small city at that time; of goldfinches collecting thistledown to line their cozy nests, rose-breasted grosbeaks flashing their lovely badges along the hiking trail, and tiny common yellowthroats calling “wichity-wichity”in the willow scrubs. 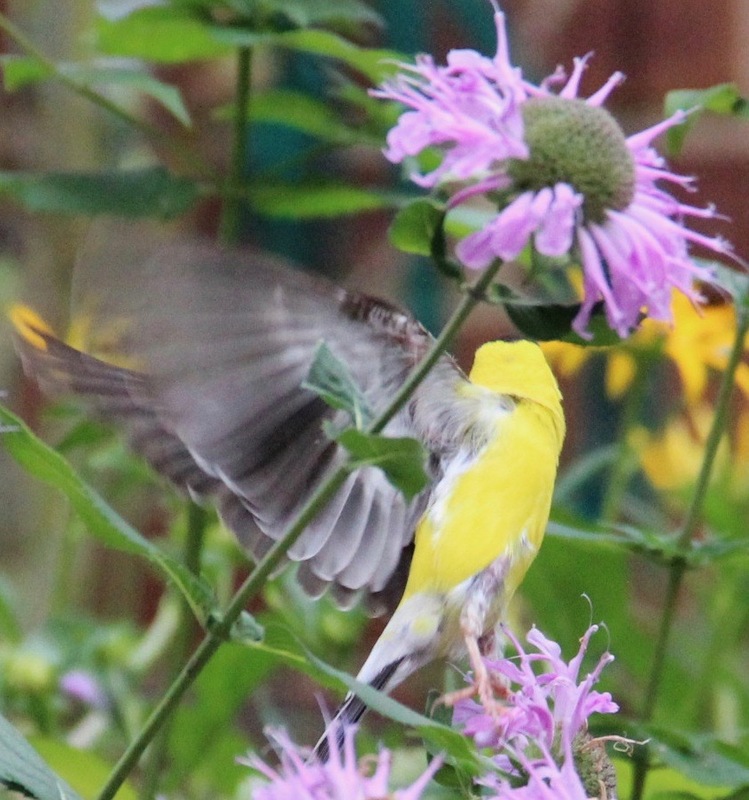 An American goldfinch (Spinus tristis) spreads its wings to fly from the garden. The birds continue to awaken beautiful memories. One night last November, when the “moon of freezing over” shone full and close, a great-horned owl hooted from a spruce in our front yard. I eased open a window to listen to its soothing call and remembered evening bike rides with Cathy in the bluff country of southeastern Minnesota. We rode wooded trails where barred owls with liquid black eyes watched us from tree limbs overhead, a hen turkey and her flock of fuzzy poults scurried about the path in front of us, and night herons croaked their calls at dusk. Black-capped chickadees (Poecile atricapillus) are companionable in the garden and the woods. 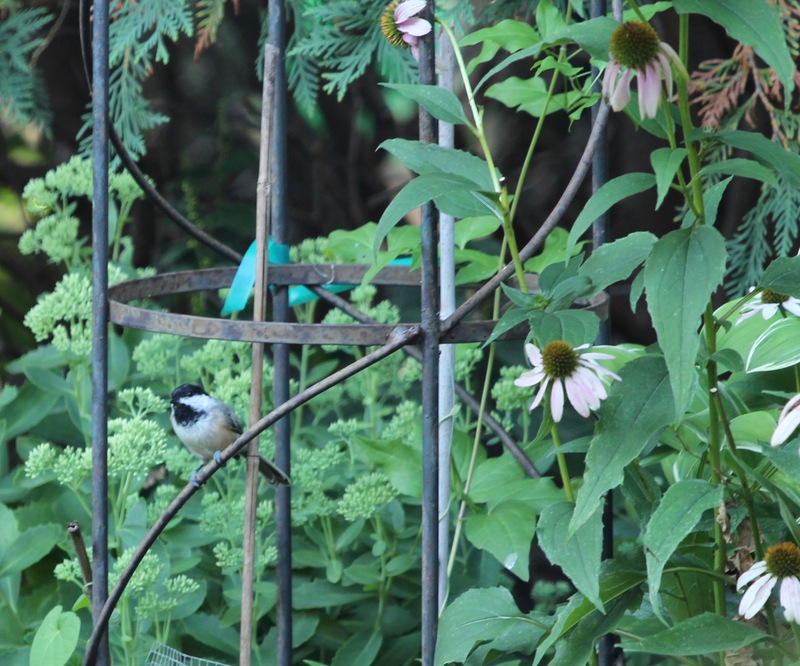 Perhaps it’s the tiny black-capped chickadee, Cathy’s favorite bird, that most often brings her to mind. One fine morning last spring after a night of thunderstorms, chickadees whistled to each other in my garden and the year’s first lily of the valley opened, covered in rain droplets. (She loved these flowers and tried to grow them for many years.) Cathy would have rejoiced in the antics of the chickadees, in the abundance of my lily of the valley garden, and in the beginning of a new day so fresh and lovely. 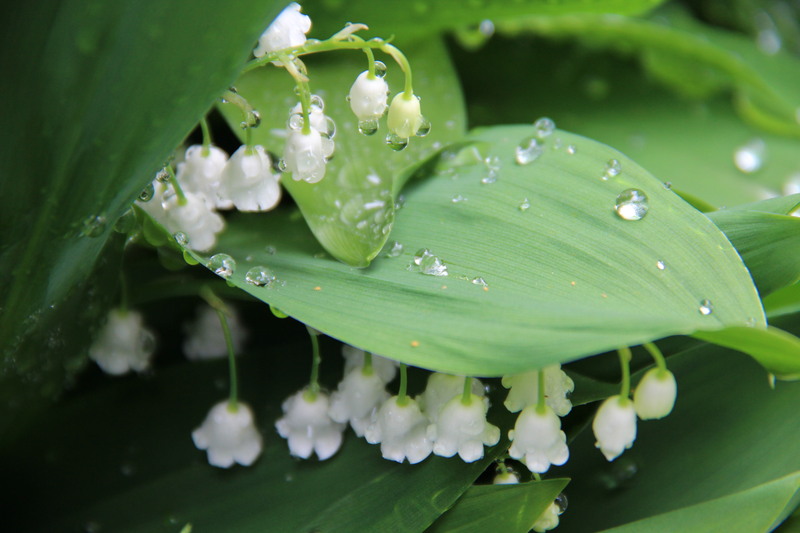 Lily of the valley(Convallaria majalis) is native to Northern Europe and Asia. 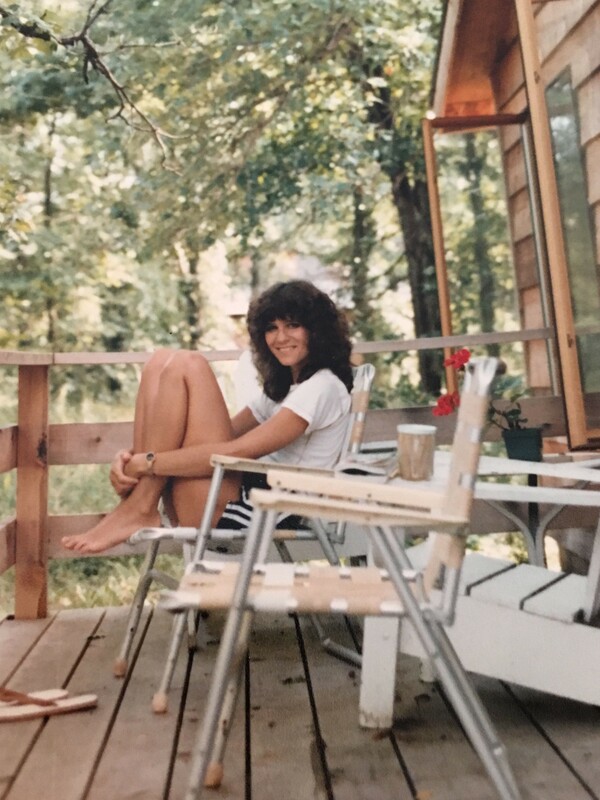 Cathy in 1982 during one of our birding trips. Cathy didn’t live long enough to identify every bird in Peterson’s field guide, and it really wasn’t about the number of birds we identified anyway. It was the time spent together walking, listening, thinking, discussing and laughing that mattered. It was taking in the beauty of nature: the golden light of summer mornings in the marsh while warblers sang in willow thickets; autumn leaves burning with the sun’s fire and the silvery seeds of asters, goldenrod, sunflowers and milkweed; bundling up for winter walks in the fields and woods, where we’d flush ruffed grouse and laugh at being startled; and discovering spring’s first wildflowers and bird nests. Over the years, career changes, raising families, caring for aging parents and other responsibilities became the focus — particularly for me. I regret not making nearly enough time for nature walks, discussions over tea, or long phone calls with Cathy. Cathy loved this simple nature blog. She was a big supporter from the beginning and often chided me because she wanted me to write more frequently. During this past year, I blogged for Cathy, as one small way to bring her joy while she fought metastatic peritoneal cancer. So it seems fitting to dedicate my blog to Cathy in gratitude for so many things—support and friendship beginning when I was a first-year science teacher; giving laughter that lightened times of tough challenge; sharing the beauty of nature through walks in every season; and the gift of holding her with one of her sons this morning. No doubt Cathy’s exploring the celestial fields and woods, and working on her new bird list right now. Dedicated to Cathy Borden, October 11, 1951 – January 27, 2016, who loved chickadees, goldfinches, lilacs, lilies of the valley, bumblebees and the sound of crickets chirping in the night.